There are a lot of reasons to visit Owatonna during the summer. Located just one hour south of the Twin Cities, Owatonna’s parks and trails become busy with hikers and bikers, and families flock to Lake Kohlmier and local water parks for some fun in the sun. 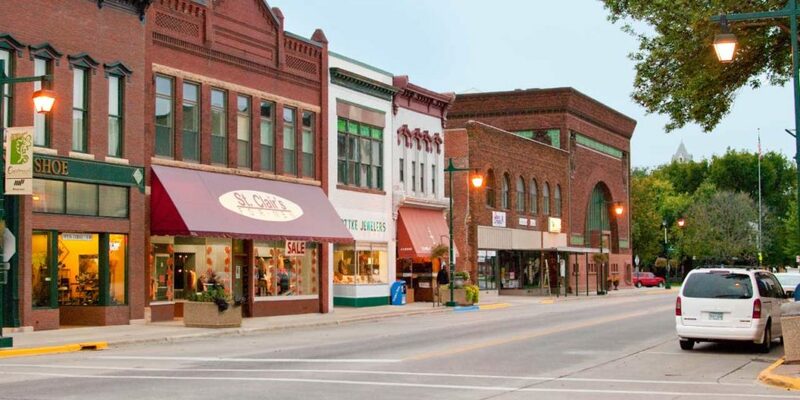 But one of the best places to visit during the summer is historic downtown Owatonna, which hosts events, walking tours, concerts and movies during the summer. The downtown district recently made it to the list of the National Register of Historic Places, an honor called “ unique” for a district Owatonna’s size. “ Some towns in the 1970s during the urban renewal [period] just leveled things and made a new downtown, whereas in Owatonna, there are new buildings in pockets, but there are a lot of original buildings that gives you an idea of what the late 1800s and early 1900s in Owatonna really looked like, says local historian Nancy Vaillancourt. “It’s gratifying to see we’ve made progress in making the downtown more attractiveand cohesive. It’s not one style added on top of another one,” she adds. If you want to visit a downtown with some important architectural landmarks, local parks and great spots to stop for lunch (and to find some delicious candy to take home), head to Owatonna this summer. Here are five of the top things to do in historic downtown Owatonna. In the early 20th century, Owatonna and Steele County were quite rich. It was the “Butter Capital of the World,” and lots of butter was shipped out of the region every day. It was around that time that the county spent $150,000 to build a bank, which would be the equivalent of about $3 million today. That building is the National Farmer’s Bank, designed at the time by a man that local tour guide Steve Jessop calls a “ prickly, angry architect” out of Chicago named Louis Sullivan, long considered the “ father of the skyscraper,” and famous for being Frank Lloyd Wright’s mentor. The building is one of Sullivan’s most pure examples of American-style architecture, recognized for its unique design of stained glass windows, terra cotta material and gold-leaf arches. It includes trademark design elements Sullivan championed during the period including cubes, squares and lots of ornamentation. Jessop leads 30-minute tours of the building, which operates as a Wells Fargo today. He enters the bank from a back door when he leads guests inside, taking them up to a balcony above the teller cages. “ I get up there and I stand and watch them and their expressions. They are left speechless,” he says. “ You can’t anticipate the sensation of walking into this room. The big stained-glass windows are the main source of light in there, and the stenciling and details combine so that there’s a greenish cast to the light. It’s ever so slight and ever so subtle, and it has a psychological effect. It’s calming,” he says. There’s no admission fee for guests who wish to go on a self-guided tour around the vicinity. 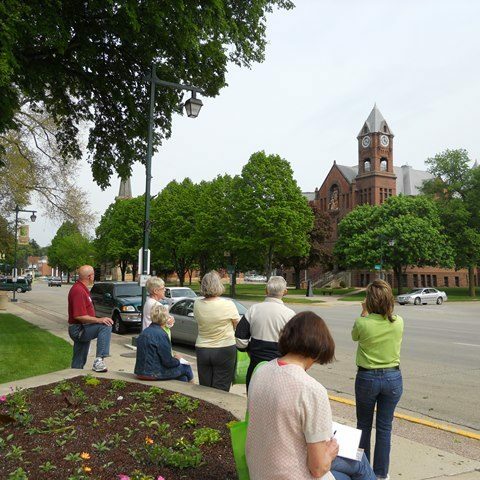 Vaillancourt leads a historic walking tour throughout Owatonna, which often highlights the National Farmer’s Bank first. “ That is the top of the list,” she says, but it’s certainly not the only stop on her list of recommended buildings worth seeing downtown. 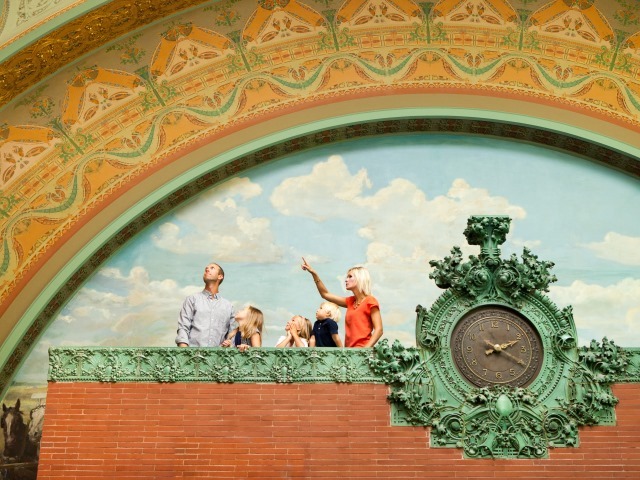 The Zamboni Building that was built in 1880 is easily identified by the same jewel box touches of terra cotta and stonework at the bank. “ It’s a unique building with a ballroom next door; it used to be a showroom for cars where the ballroom is now,” she says. The Federated Insurance Companies building is also a popular stop on the tour, though you can only view it from the exterior. It’s one of the last examples of Prairie School architecture in the area. Vaillancourt also always stops at Central Park, and “ I would be remiss if I don’t suggest the public library. It’s a very cool building inside, too, and it’s fairly original,” she says. The downtown shopping district has many boutique stores and dining options. Several shops like Kristi’s Clothing Boutique, Kottke Jewelers and Straight River Rug Hooking & Fiber Arts are spots where you can find one-of-a-kind items. Stop by the Little Professor Book Center for great reads. 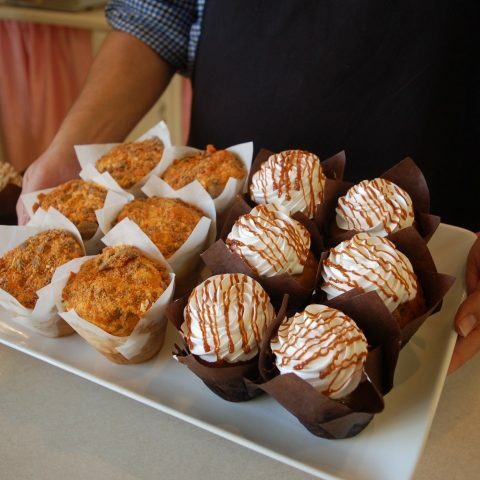 When it’s time to eat, the downtown area has plenty to offer, from delicious homemade pizza to old-fashioned candies. Central Park Coffee is the perfect place to grab a warm cup and take breaks in between shopping while enjoying its relaxing atmosphere. Other ideal places to grab a quick snack are at Costas’ Candies and Restaurant where you can order fudge made from a 90-year old recipe. Jessop also recommends the Greek salad at Costas’. 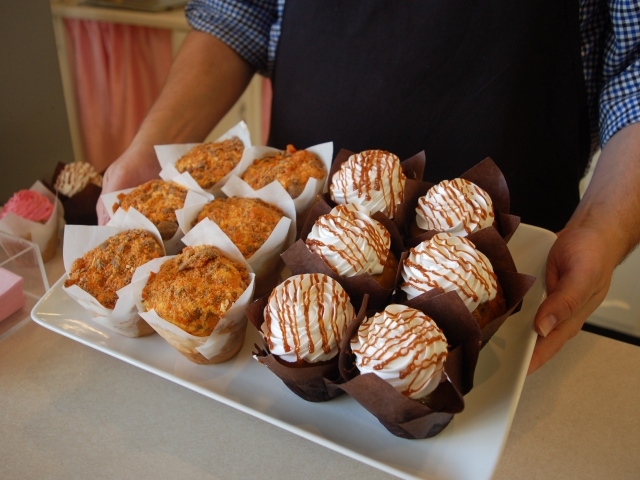 Stop by Old Town Bagels for a chewy egg sandwich that will instantly fuel you to do a full day’s shopping. Mizuki Fusion (sushi), Pupuseria La Paz (El Salvadorian pupusas), and Nick’s Pizza Palace (where you can enjoy a “Colosseum Pizza” ) all are located in downtown Owatonna as well. Check out our complete shopping and dining guides for more information. 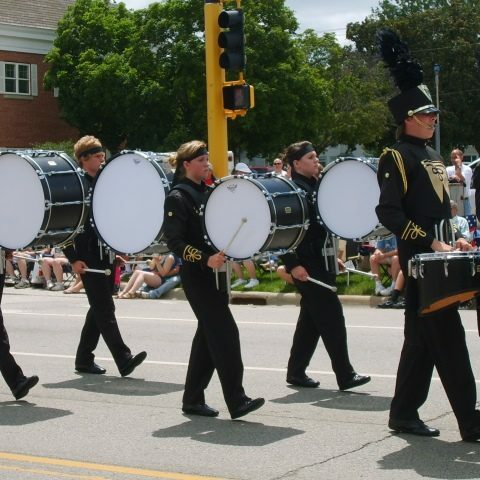 Mingle with the locals and spend your day outdoors at one of Owatonna’s annual events during the summer. 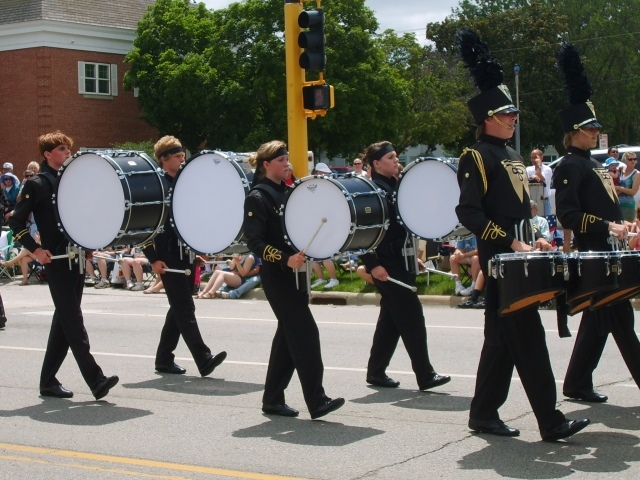 Crazy Days in downtown Owatonna is a great fun-filled family event (July 25-27). This three day event includes sidewalk sales, a kiddie parade, a petting zoo, and many more activities. 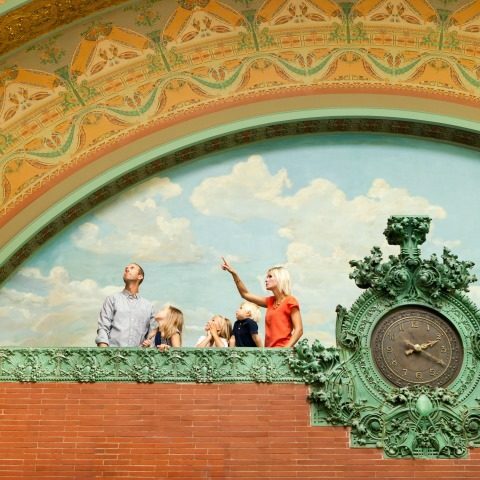 Visit Owatonna will be offering free tours of the National Farmers’ Bank during Crazy Days as well. You can also take a free shuttle between the downtown activities and Art on the Hills, an art festival at the Owatonna Arts Center on July 27 & 28. Enjoy a wide variety of musical groups that perform throughout the summer evenings in Central Park during the 11@7 Concert Series on Thursday nights during the summer. The night market, Downtown Thursdays, is returning to historic downtown Owatonna for 2 nights; June 5th and August 1! Gather a friend or the whole family for a evening of food, music, shopping and art just outside the Louis Sullivan “jewel box” Bank. Downtown Owatonna is the place to enjoy our beautiful Southern Minnesota evenings. 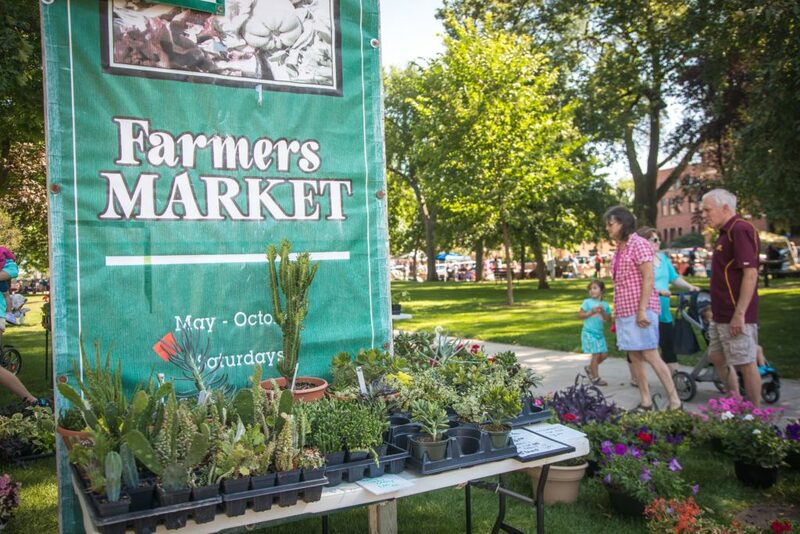 If you are looking for something fresh and Minnesota grown, check out one of Owatonna’s Farmer’s Market! 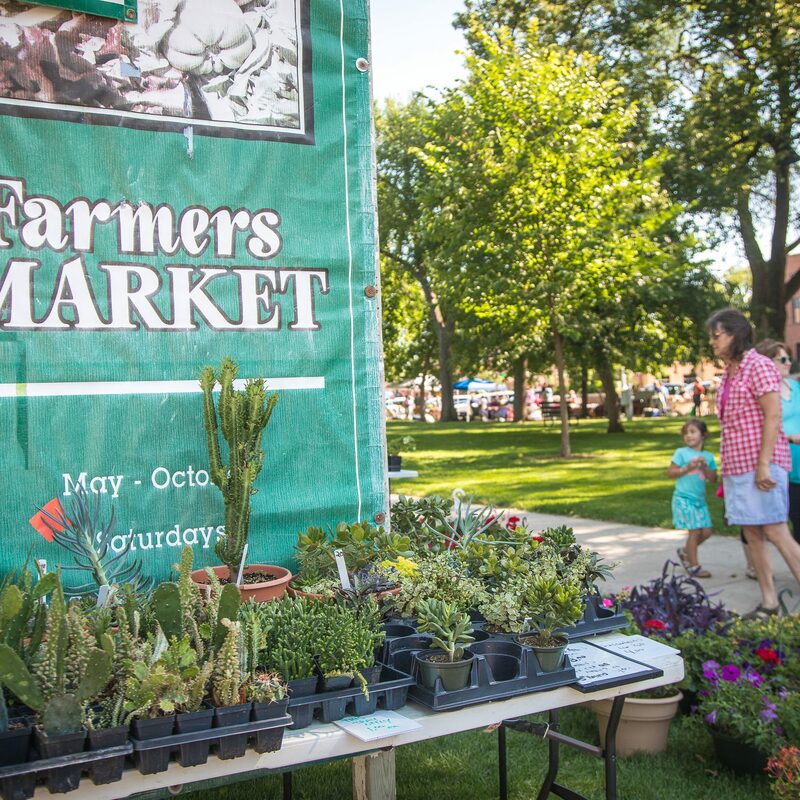 Enjoy an early summer’s morning in downtown Owatonna at the Farmer’s Market in Central Park every Saturday from 7am-12pm during May to October. Shop locally grown and sourced fresh vegetables, flowers and hand-crafted goods from more than 80 vendors. 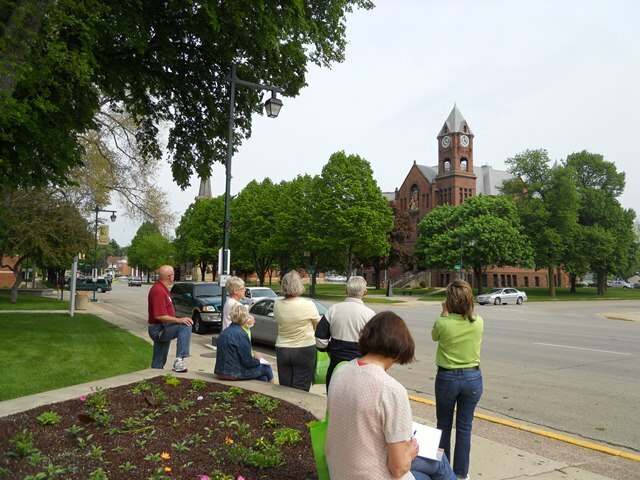 Looking for an evening activity after your summer day visiting historic downtown Owatonna? Check out Owatonna’s newest market, The North Market. Find locally grown produces, food, and farm products from vendors at this market on Tuesday evenings from 4-7pm at the Grace Baptist parking lot. 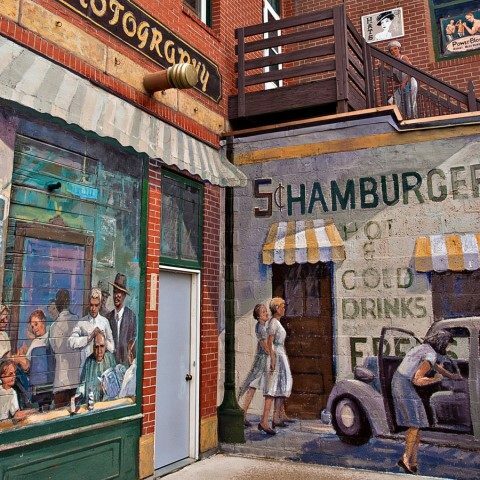 Downtown Owatonna showcases a collection of cool local murals. Stop at iconic landmarks like the Little Red School House Mural to see a life-like painting of school children in uniform on the side of the building. 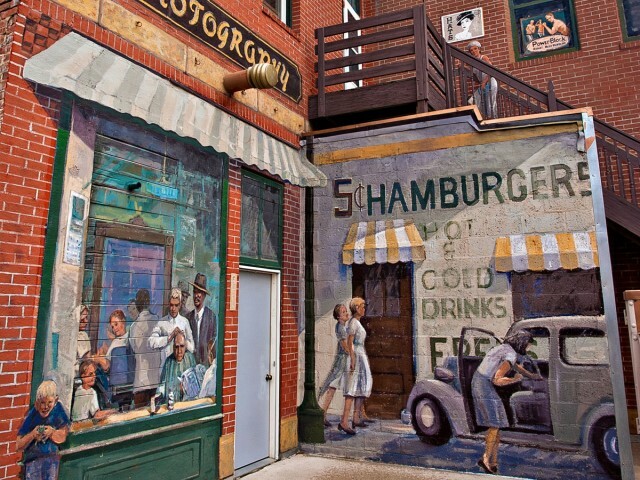 Other notable murals to see are the Main Street Mural for a mind-trick of artificial storefronts, apartments and the former Roxy Theater, and Fire Hall Mural to see more optical illusions of a firehouse on its side wall. Finally, don’t miss a walk over the Morehouse Bridge, which hovers above the Straight River. The bridge is a perfect photo op spot during the summer with a backdrop of lush green trees, brilliant flowers and soft currents. Need help getting around? Check out our Historic Downtown Map or stop into the Owatonna Area Chamber of Commerce & Tourism at 320 Hoffman Drive. For more information about downtown events visit our calendar of events page. Request a visitor guide or sign up for our e-newsletter for more information.